La-La Land Records and Paramount Pictures present the CD premiere of legendary composer Elmer Bernstein's (THE MAGNIFICENT SEVEN, TRUE GRIT, AIRPLANE, GHOSTBUSTERS) original scores to Paramount Pictures' acclaimed westerns starring John Wayne, THE SHOOTIST (1976) and THE SONS OF KATIE ELDER (1965). 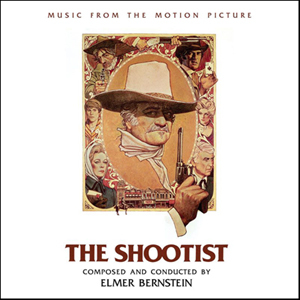 Bernstein's original score tracks for THE SHOOTIST make their world premiere on this release, mastered from'' stereo mixes. This release also marks the CD premiere of Bernstein's re-recording and arrangement of his THE SONS OF KATIE ELDER score for the original Columbia Records soundtrack CD, which presents adaptations of his film cues, sometimes combining two or more of them in single tracks, while other selections begin with music from the film, but continue as extended arrangements of specific melodies. Included is the title song performed by Johnny Cash, as well as the John Wayne narration.